Eye tracking has long been known and used as a method to study the visual attention of individuals. There are several different techniques to detect and track the movements of the eyes. However, when it comes to remote, non‐intrusive eye tracking the most commonly used technique is pupil centre corneal reflection (PCCR). The basic concept is to use a light source to illuminate the eye causing highly visible reflections, and a camera to capture an image of the eye showing these reflections. The image captured by the camera is then used to identify the reflection of the light source on the cornea (glint) and in the pupil. We can then calculate a vector formed by the angle between the cornea and pupil reflections—the direction of this vector, combined with other geometrical features of the reflections, is then used to calculate the gaze direction. 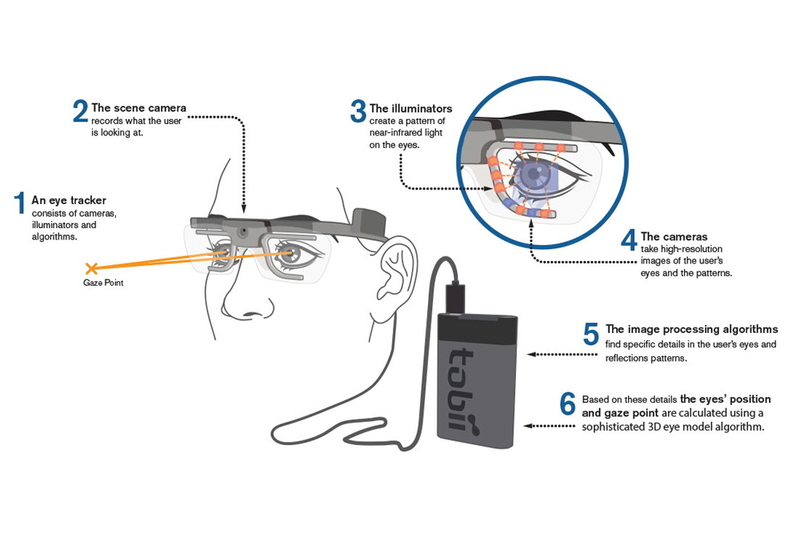 Tobii eye trackers are an improved version of the traditional PCCR remote eye tracking technology (US Patent US7,572,008). Near-infrared illumination is used to create the reflection patterns on the cornea and pupil of the eye of the subjectand image sensors are used to capture images of the eyes and the reflection patterns. Advanced image-processing algorithms and a physiological 3D model of the eye are then used to estimate the position of the eye in space and the point of gaze with high accuracy. 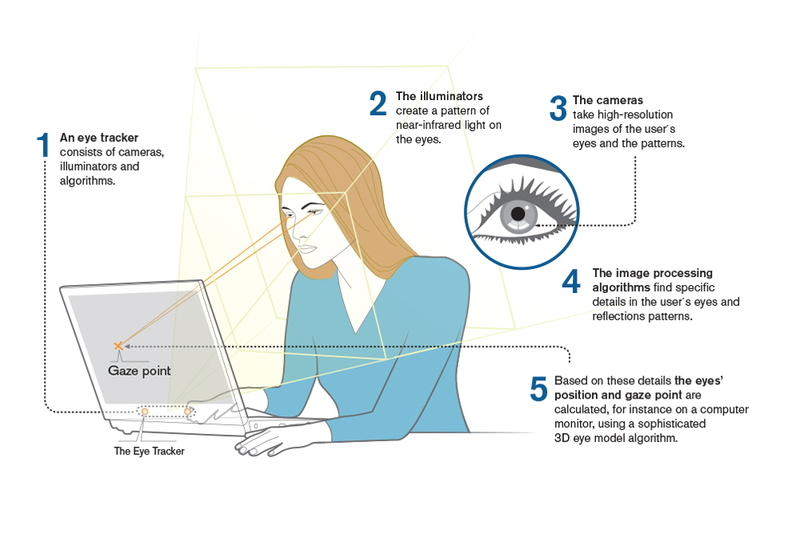 The image on the right shows how a screen based eye tracker works. The basic eye tracking components are the illuminators, cameras, and the processing unit containing the image detection, 3D eye model and gaze mapping algorithms. The image on the right shows how a wearable eye tracker works. Just like the screen based counterparts, a wearable eye tracker also is constituted by the same basic eye tracking components: illuminators, cameras, and the processing unit containing the image detection, 3D eye model and gaze mapping algorithms. The objective of this page is to provide a description of the different components and processes that are responsible for the timing accuracy of Tobii Eye trackers.